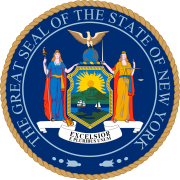 The 1871 New York state election was held on November 7, 1871, to elect the Secretary of State, the State Comptroller, the Attorney General, the State Treasurer, the State Engineer, a Canal Commissioner and an Inspector of State Prisons, as well as all members of the New York State Assembly and the New York State Senate. Alumni College 2017: Sarah Horowitz's "The Rise of the Third Republic"
The Democratic state convention met on October 4 at Rochester, New York, and re-nominated six of the seven incumbents. Only Diedrich Willers, Jr., was nominated for Secretary of State in place of Homer A. Nelson. In the wake of the Tweed and Canal Ring scandals, the whole Republican ticket was elected. 97 Republicans, 25 Democrats and 6 Reform Democrats were elected for the session of 1872 to the New York State Assembly.